Did you know that the Old Farmer's Almanac now has a Facebook page? 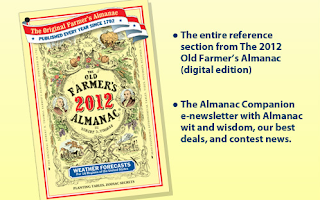 If you Like their page, you can get a free digital copy of their 2012 Old Farmer's Almanac! Doesn't that seem a bit ironic?? Is that coupon real or fake? Fraudulent coupons hurt us all! If you received a printable coupon that looks too good to be true; it may be! Free product coupons that can be printed more than once should set off a red flag for you, unless the coupon can be found on the manufacturer's website. You can visit the Coupon Information Center to verify the authenticity of any coupon.